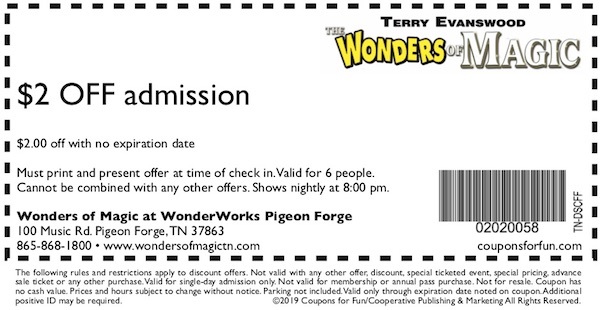 Wonders of Magic at WonderWorks in Pigeon Forge, Tennessee - Get savings coupon! The Wonders of Magic roots run deep in Pigeon Forge, and Terry Evanswood is the longest running headline performer in town. His Sold out shows have been audiences for 17 years. Kids. Adults, and even granny’s mouth will be open in jaw-dropping amazement! This is the BEST magic show in Tennessee and should not be missed!